TOLEDO, OH--(Marketwired - Jan 18, 2016) - To meet the growing demand for pizza in the Tulsa, Oklahoma, area, Marco's Pizza® franchise is seeking to partner with entrepreneurs who want a slice of the action. The demand for pizza in Tulsa is growing. Tulsa is also business-friendly. In 2015, Oklahoma ranked in the top 20 states on Forbes' Best States for Business list, partly due to the business tax climate in Oklahoma being one of the best in the country -- making it an excellent region for a Marco's Pizza franchise. Once customers try Marco's Pizza's Ah!thentic Italian-style pizza -- fresh-made with delectable cheeses, meats and vegetables -- they're hooked. Marco's has prime locations available in Tulsa for entrepreneurs to start building their franchise restaurants and loyal customer base. "Our franchisees come from a remarkably wide variety of backgrounds. But there's a common thread among our franchisees -- passion for the Marco's product. Almost half of them were Marco's consumers first. They fell in love with our product," said Cameron Cummins, Vice President of Franchise Development for Marco's Pizza. Marco's prides itself in making the best pizza money can buy. Pizzas are hand-made in the Italian tradition. They use fresh, never-frozen cheeses, make the dough in stores daily and top it with only premium meats and vegetables. Founded in Toledo in 1978, Marco's is the only Top 20 pizza chain started by a native Italian. Marco's has enjoyed stunning growth in recent years and is on pace to open 1,000 restaurants by the end of 2017. The brand's proven business model and sustainable growth have been heralded by the likes of Forbes, Consumer Reports, Entrepreneur, Franchise Times and Nation's Restaurant News. Not only is Oklahoma's economy booming, but Tulsa is home to several colleges and universities, such as the University of Tulsa. The downtown area has been undergoing a resurgence, and visitors to the 19,200-seat sports and event arena, BOK Center, and the $39.2 million Oneok Field minor league baseball park all need somewhere to eat. Tulsa also hosts several annual events, such as the Tulsa International Mayfest, which attracts more than 300,000 people. Tourists visiting Tulsa, as well as area residents, want dining options, making Tulsa an ideal location for Marco's Pizza. The U.S. Department of Agriculture recently published a study on American eating habits that found on any given day, 13% of the entire U.S. population is eating pizza. With Tulsa's metro population of 975,478 -- that works out to about 126,000 people feasting on pizza daily, and Marco's is ready to grab a big slice of that market. Competitors have oversaturated their markets, but Marco's Pizza still has prime locations for franchisees to set up shop -- Tulsa is one of them. Marco's Pizza has the fastest-growing unit growth, according to Nation's Restaurant News, who named the beloved pizza franchise as part of its Second 100 List -- an analysis of businesses that are smaller but are focusing on growing around the nation. The publication states that while the pizza industry is mature and growth is limited, Marco's Pizza is the exception. Not only is Marco's growing faster than other pizza franchises, currently on pace to open its 1,000th location in early 2017, Marco's Pizza sales growth also is higher than any other pizza franchise. 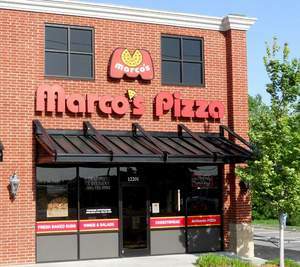 The publication reports that Marco's Pizza sales growth is tops for system-wide sales in the Second 100 pizza segment. Marco's Pizza is seeking quality franchisees who are committed to making their franchises places where customers want to buy fresh, delectable pizza -- welcoming, friendly individuals who remember customers' names and are passionate about the Marco's product. The investment required to start a Marco's Pizza franchise is typically about $350,000. The pizza franchise is looking for people who have a net worth of $150,000 and a minimum liquidity of $100,000. Previous restaurant experience is not necessary to open a Marco's Pizza. The company's team of veteran pizza executives has experience growing brands and is always ready to help franchisees throughout their careers. At a six-week training at Marco's University, franchisees learn how to make the perfect pizza in the company's state-of-the-art kitchen. In addition to learning about the product and how it is made, the company helps franchisees learn to manage the business side of the franchise. Franchisees learn how to train staff, manage finances and study market analysis, as well as learn the insurance requirements, leasing issues and marketing savvy needed to be successful. To learn more, visit www.marcosfranchising.com. Franchisees get lots of training in all aspects of running a Marco's Pizza before they open their stores. Marco's Pizza is looking for franchise partners to open locations in Tulsa, Oklahoma. Marco's Pizza is in the headlines about expansion across the U.S.; we're more than hype!